A big thank you to Susan at A Southern Day Dreamer for hosting Outdoor Wednesday. It is the first time I've participated for January and February on the prairie is so often brown. And brown in the outdoor world is not pretty unless it is loamy soil! 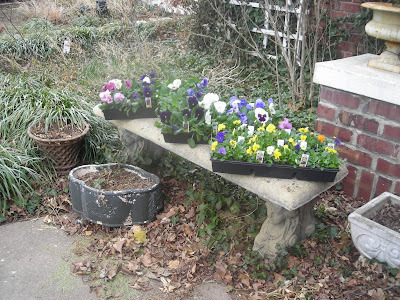 But it is warmer and the pansies are in the garden center. Three flats came home with me this weekend. Three flats of happy smiling faces. Lined up on the concrete bench in front of the house with flower pots bare since the winter pines were removed. Leaves not raked in the fall will need to be raked but that is a chore for another day. 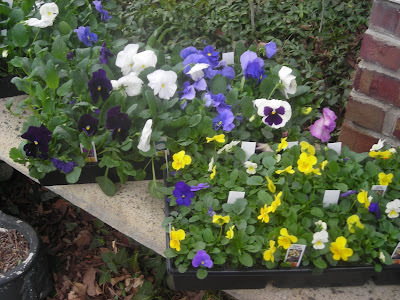 It's time for pansy planting! The violas go into the black planter in front. I love the daintiness of these flowers and the colors of yellow, white and violet . . . and an occasional orange one! 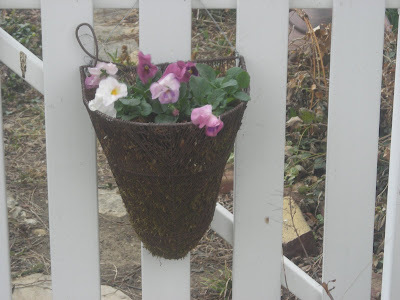 There's even enough pansies left to put in the basket that hangs on the front gate. Not only will the pansies brighten the outdoor garden, but wee bouquets will adorn tabletops inside especially a wee Waterford vase that sits on my dressing table. Pansies, too, will be added to salads for color AND flavor. Nothing like food that smiles back at you! And when the blooms are prolific . . . I'll pick them and sugar them. Great for decorating cakes and cupcakes when pansies are no longer blooming in the garden. Sometimes I feel that pansies are a splurge but in retrospect, we get a lot of mileage out of those three flats. Pansies are the best flowers. So pretty. When I was a girl I was told that fairies lived inside them! How true -- they are fairy flowers -- and we do have fairies in our garden. Welcome to Outdoor Wednesday Martha! Love pansies...cheery little faces! Thanks for sharing your photos. I love violas and pansies! How exciting for spring to come and be able to work outdoors and plant happy flowers. Enjoy! Pansys are so pretty. I never heard about the fairies, but they do have faces. Thanks for sharing. Happy OW. I love pansies, and I think it will be fun for you to have wee bouquets in wee vases on your tabletops! They are my sorority flower, so I have a special place in my heart for them. Pansies just make people smile. They are such a cheery flower. Your photos made me smile. Pansies "smiling faces" greet folks as they visit your garden. Great choice! Happy Outdoor Wednesday. Pansies aren't a splurge, they are a necessity. They feed our souls with their beauty and cheerful, winsome faces. Pansies are a favorite and of course there are fairies in the garden! Everyone knows that! Would love to have you post about how to "sugar" them. That would be wonderful to put on some spring cupcakes! They do look like faces :-) What a variety you have there. Very colorful! Pansies are such a pretty spring flower. Very nice photos. Martha, Loved your post today as usual.Like you I do enjoy the pansies. Here in N FL I am able to plant them in Nov. and enjoy them up until mid May. Right now they are just full of blooms and gorgeous.Someone posted here that they would like you to post how you sugar your pansy's. Great idea. So pretty! I just adore pansies! Happy OW! A lovely harbinger of things to come. Hi...This is my first visit and I must say your home in the header photo is beautiful! I've never planted pansies...but I do enjoy seeing them...yours are so pretty! Love the pansies, and the violas, you will get many days of pleasure from them.Thank you for sharing. Fairies come out when you least expect them and . . . they don't like to be seen! I love pansies, and enjoyed yours! Still to early here.. 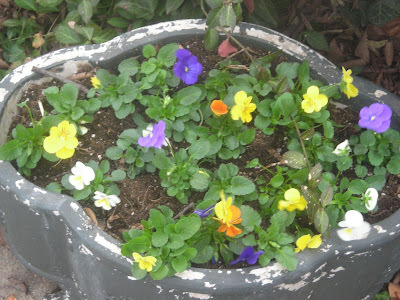 Thanks for your visit to my blog..
How nice to have your pansies already. I am just a few weeks shy of the last frost. They are so pretty, like smiling faces as you say! I am so envious that you have pansies in your garden center's already! They are a favorite of mine and are the best way to say Hello Spring! I eat them all the time -- in spring they are sprinkled on the salads -- nothing like your food "smiling" at you!